Gluskin Sheff's David Rosenberg isn't rattled by the recent volatility in the financial markets. 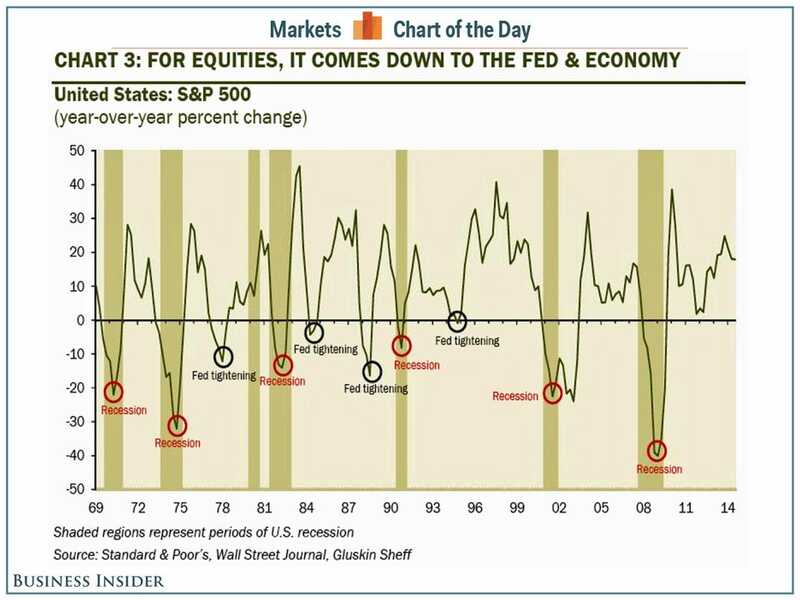 "For stocks, it always comes down to the Fed and the economy," Rosenberg said to Business Insider. "The reality is that bear markets do not just pop out of the air," he wrote. "They are caused by tight money, recessions, or both. These conditions do not apply, nor will they until 2016 at the earliest." We recently asked Rosenberg for what he considered to be the Most Important Chart In The World. He sent us this annotated chart of the year-over-year percent change in the S&P 500. As you can see, the big plunges indeed came during recessions and monetary tightening cycles. Based on the trends in the Conference Board's Leading Economic Index, a recession is "at least two years away," Rosenberg said. "That is one peg — the expansion being sustained. The other is the Fed policy, and any actual rate hikes now seem to be more of a 2015 than a 2016 story." The Federal Reserve concludes its two-day Federal Open Market Committee meeting on Wednesday, at which point we may get some clues regarding the timing of the Fed's first rate hike. For now, all we know is it's a considerable ways off.